Vehicle Accidents caused by texting and driving are injuring and killing people every day but sadly the percentage of drivers who are texting or manipulating electronic devices while driving continued to increase in 2012 according to the latest National Occupant Protection Use Survey (NOPUS) of the National Highway Traffic Safety Administration. In 2012, the rate of drivers texting while driving was of 1.5% compared to 1.3% in 2011. The rate of people using a hand held cell phone has been steady at 5% since 2009 with a significant higher rate of usage among female drivers (6% compared to 4% for male drivers). 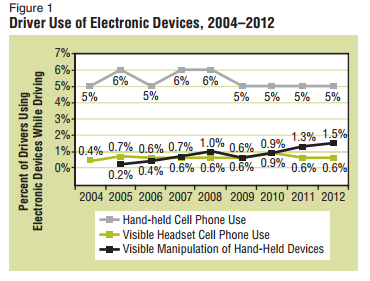 0.6% of drivers used headset cell phone while driving in 2013. Even though the percentage of young drivers who are texting while driving decreased from 3.7% in 2011 to 3% in 2012, this rate is still the highest among all age classes. 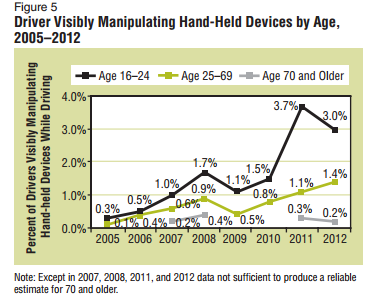 Among drivers between 25 and 69 years old the rate of drivers who are manipulating electronic devices while driving increased to 1.4% in 2012 compared to 1.1% in 2011. Please don’t text and drive and remember that any accident involving texting and driving could have been prevented!